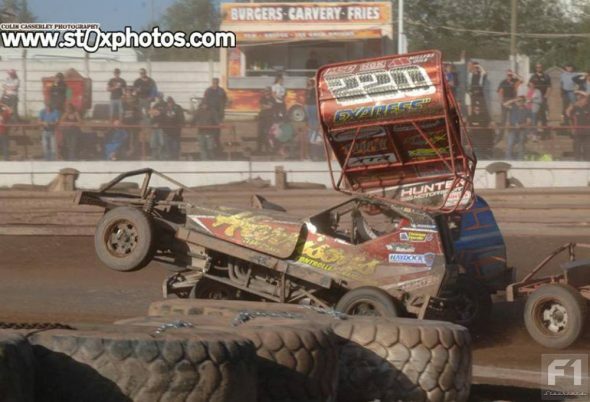 The first meeting of the 2016 Shootout series got under way at the Startrax Stoke site in the Potteries on Sunday 11th September. 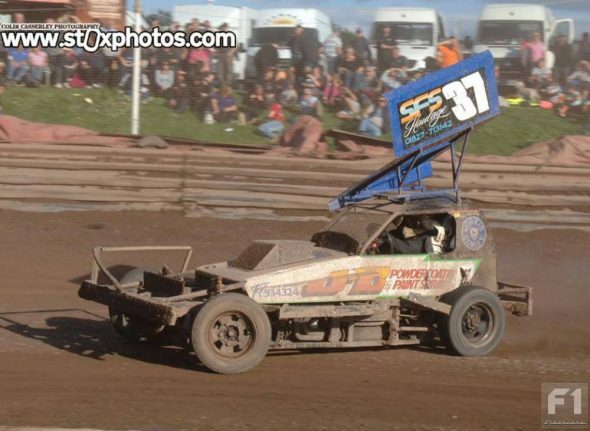 Originally scheduled for the Saturday night, the meeting was re-scheduled to the day after due to the F2 World Final being held at Mildenhall on the Saturday, thus leading to a clash for fans of both formulae. The Loomer Road stadium continues to impress. It’s the second meeting there this year; the earlier meeting being (or at least starting) in wet (well, Monsoon downpour) conditions. This being Stoke, the opposite was the case for this meeting, with it being a warm, sunny and breezy day. The track is now very much improved with new drains, a raised infield and centre area and better pits. 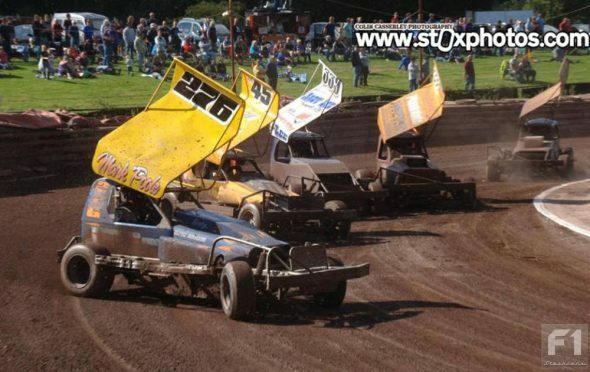 The place has seen a nigh on £60,000 investment, with the work being done by A R Richards who sponsor the Stoke Speedway team (they also supply the big green tractors at the Startrax meetings). 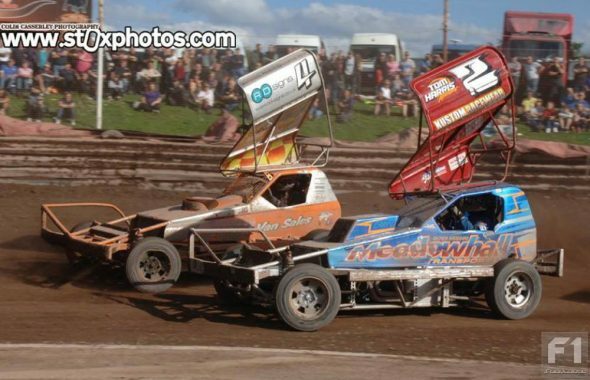 So on to the racing, and the format was 2 heats, consolation, final and grand national; about right for a 40-car attendance meeting. 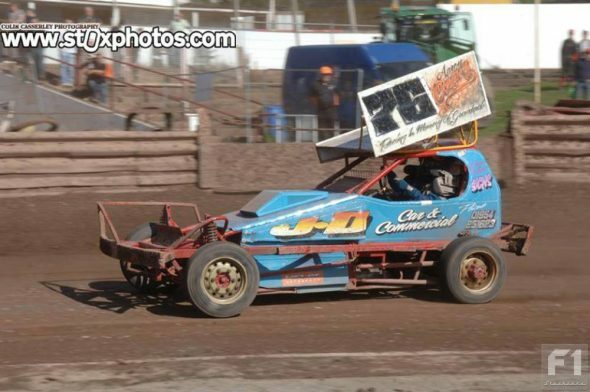 Heat one gridded 18 cars including the 348 car of John Wright in his second meeting, starting at the back in the sunny conditions. 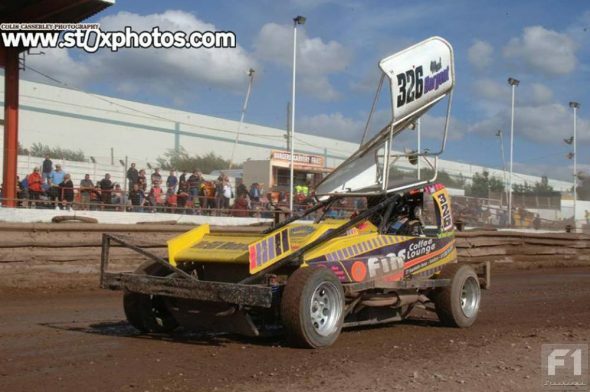 From the off it was 326 Mark Sargent that piloted the lead car, who has being doing rather well recently. The lead Shootout driver 4 Dan Johnson fired the 127 Austin Moore car aside but mistimed the move, letting 55 Craig Finnikin through. 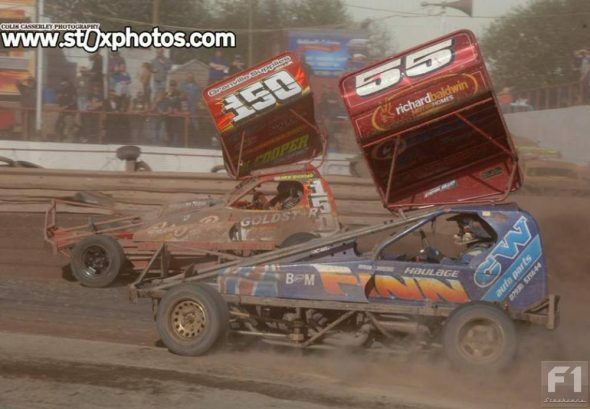 At lap 3 it was Sargent from 45 Nigel Harrhy and 338 Chris Brocksopp. The Finnikin car, which had looked very quick, slowed with a OSR rear tyre blown, letting Rob Speak (318) and Johnson through. Up front, little had changed by 4 laps to go, with Mark Sargent holding onto a healthy lead from Harrhy second, followed by Speak and Dan Johnson. 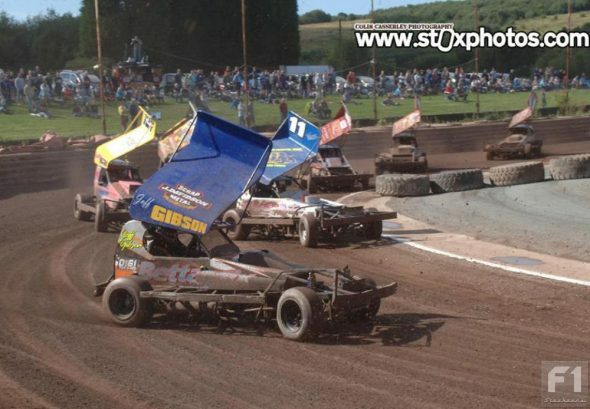 This remaining unchanged to the end, the 4 car of Johnson, however, was docked 2 places in the results for a jumped start. 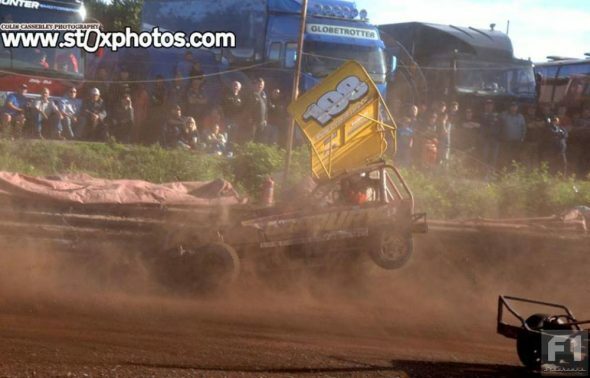 Mark Sargent dominated Heat 1 at Stoke. 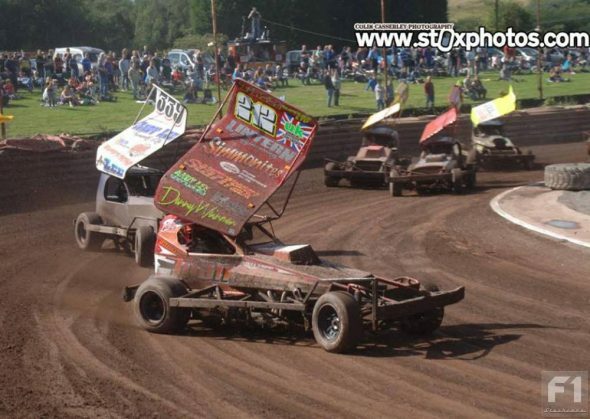 Prior to the start of Heat 2 – and not to be out done by the Coventry World Final efforts – the crowd were treated to a few laps of tractor racing antics (well, ok intense grading), with the track needing a bit of pre-race watering in the dry conditions. Twenty one cars gridded for the heat, the early leader being 415 Russell Cooper. 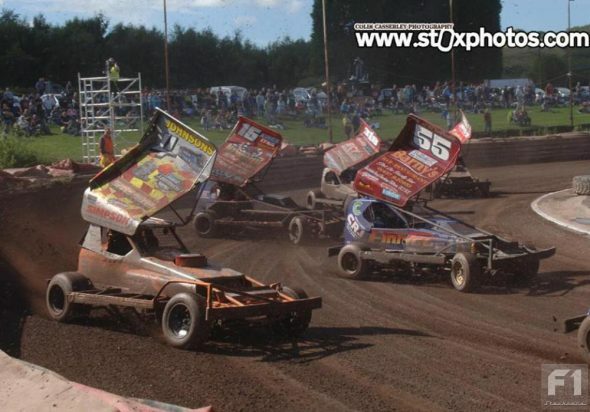 Steve Whittle (183), Chris Cowley (37) and Mark Gilbank(21) all hooked up on turn 2 but managed to all get going, whilst further back 445 Green and 150 Sworder were having a good battle before Green got past. 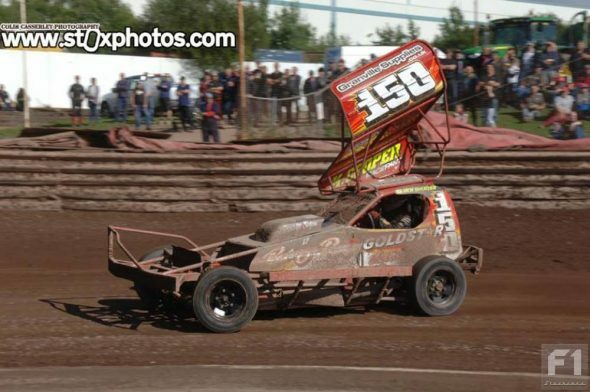 Frankie Wainman Junior (515) got past Lee Fairhurst (217) on turns 1/2 for the lead and, with 5 to go, it was Wainman from Fairhurst followed by 2 Paul Harrison, with Russell Cooper having a great race and still holding onto 4th place. 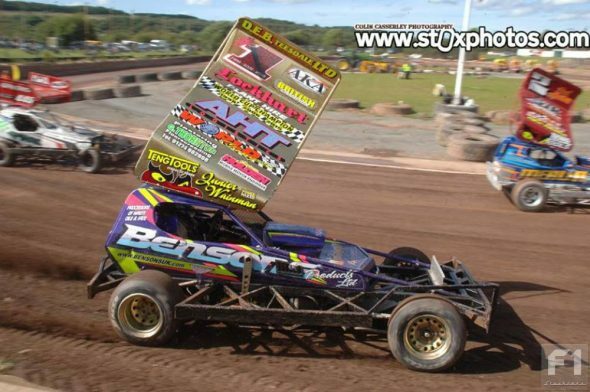 On the last bend, Paul Harrison put in good hit on Fairhurst, half spinning the 217 car. Harrison moved through to second spot. The new World Champion started the Shootout with a heat win. 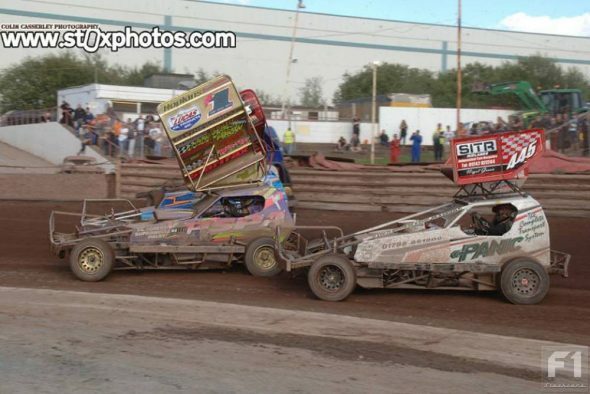 The Consolation saw Sworder and Finnkin the only of the shooters yet to qualify in a 19-car race. 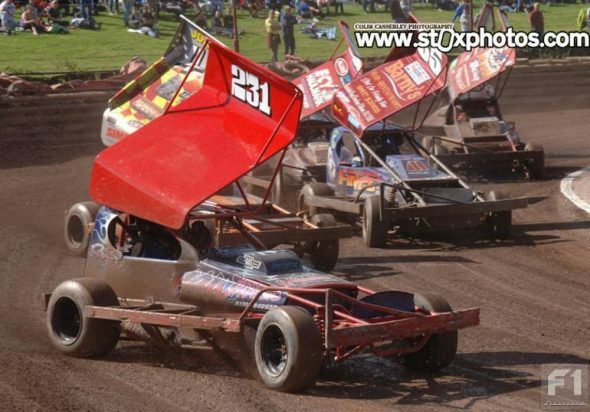 Early on, at lap 2, 335 Woodhall, 192 Luke Dennis and 127 Austin Moore all hooked up on turn 3, and the following lap 448 Jason Eaton, 338 Brocksopp and 118 Steve Harrison decided to join in the party on turn 3 leading to the yellow flags. 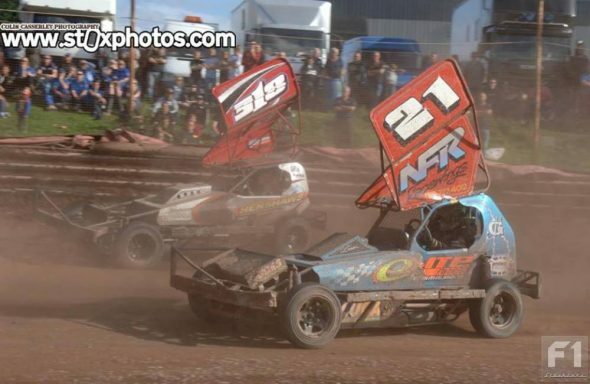 At the restart, it was 76 Aaron Cozens from 207 Ben Hurdman and 451 Martin Spiers leading them off. Finnikin spun on turn 3 but got going and, at halfway, it was Hurdman from Cozens, followed by 21 Mark Gilbank with 150 Mick Sworder hunting down the 21 car. With two laps to go, Cozens, who was still in second from Hurdman span on turn 2 but managed to get going again. On the last lap, Sworder put in a last bend lunge on Gilbank for second but Gilbank managed to hold on and kept second from Sworder third. 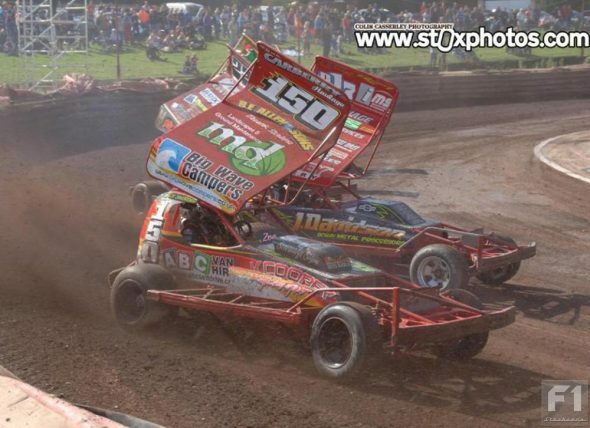 Craig Finnikin and Mick Sworder in the Consolation. The Final was a fast and furious race, also very dusty and as your reporter was downwind (must make note for future meetings) the write-up will be brief! 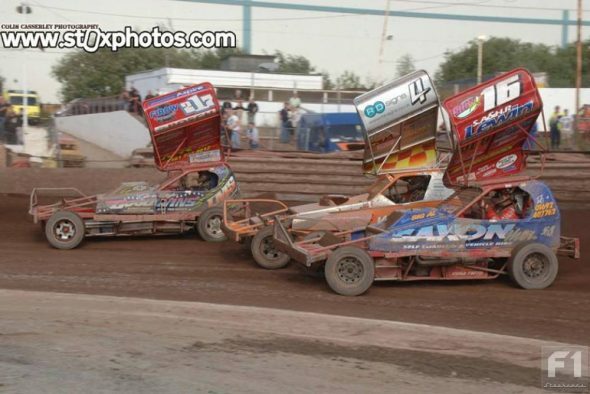 On turns 1/2 276 Mark Poole, 244 Mick Rogers and 207 Ben Hurdman all hooked up, half blocking the track. Most of the shootout drivers were delayed but both Speak and Sworder snuck through so, by lap 6, it was again that man Sargent leading from Nigel Harrhy (both with a healthy lead) from 37 Chris Cowley, then Speak and Sworder. 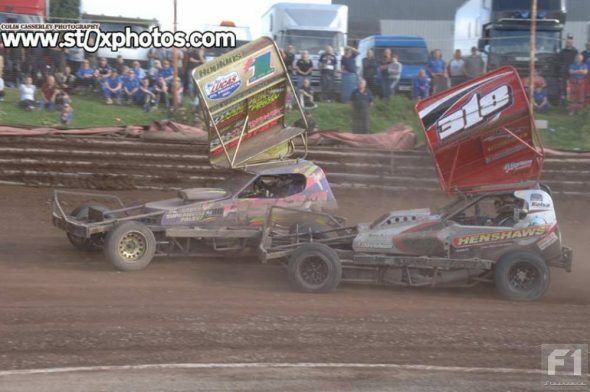 With a dry, fast track, it looked unlikely that the front two would be caught but, on lap 11, 445 Nigel Green and 422 Ben Riley hooked up on turns 3/4, leading to the yellows. On the restart, Sargent bogged down and Harrhy was sandwiched and clattered from behind. leading to both spinning and their leads evaporating. 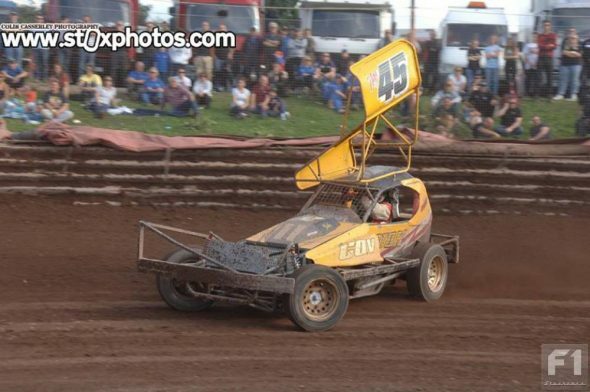 A lap later, Cowley spun Speak on turn 3, delaying 318 and on the next bend Frankie Wainman Junior was behind Speak and clattered him into the fence. This altered things considerably, letting 150 through for a healthy lead. The other shooter to catch up particularly was Craig Finnikin, getting second in the last, vision-obscured laps! Results: 150, 55, 16, 2, 212, 220, 515 (1), 445, 217, 231, 21, 37. Again, while the track was well-watered for the Grand National, on a hot ,dry day the base is just bone dry in these conditions so again, the write-up will be brief. That man Sarge was at it again, leading from the front at the start. 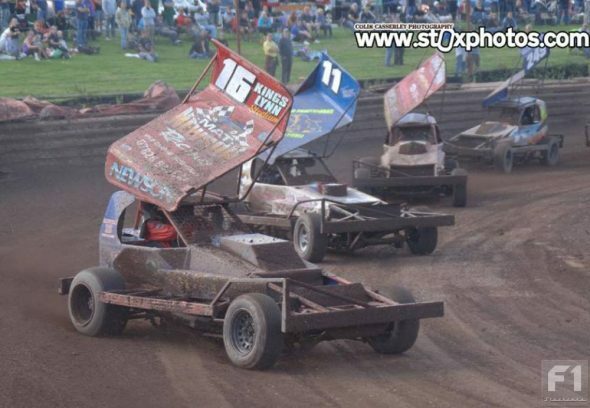 Meanwhile the Wainman and Speak roadshow was in town again, with the Wainman car spinning Speak on turns 1/2 leading to both cars retiring from the race. It should prove an interesting Shootout series if this roadshow continues! Through the dust, Sargent came through for another win (surely a blue or even red roof for the next grading period?) from Ben Riley and Dan Johnson clawing back some points in third. Results: 326, 422, 4, 55, 259, 16, 445, 37, 212, 220. 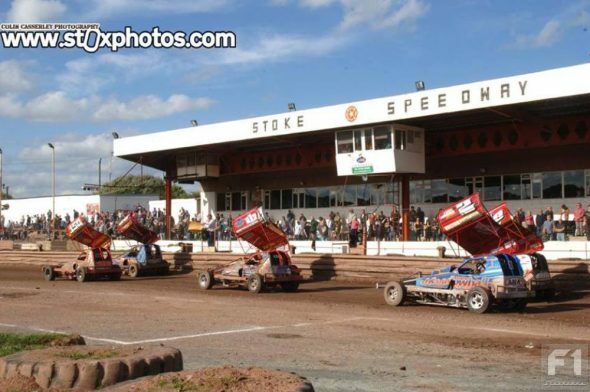 Another great day’s racing at Stoke. 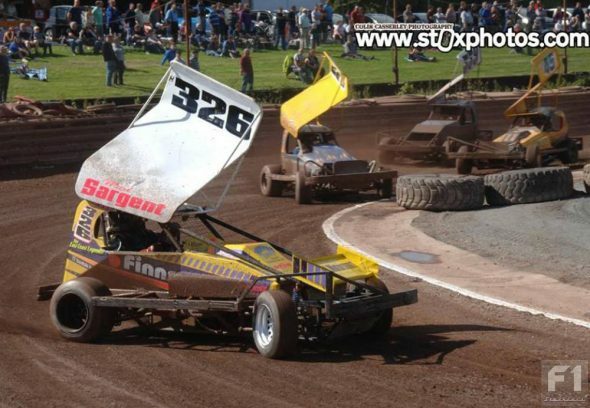 A pity about the dust but there’s little that can be done in those conditions and the track staff graded, re-graded and watered the track superbly, but as many went home with a bonus sun tan top up it wasn’t all that bad. A few more meetings for 2017 please is all I can say. 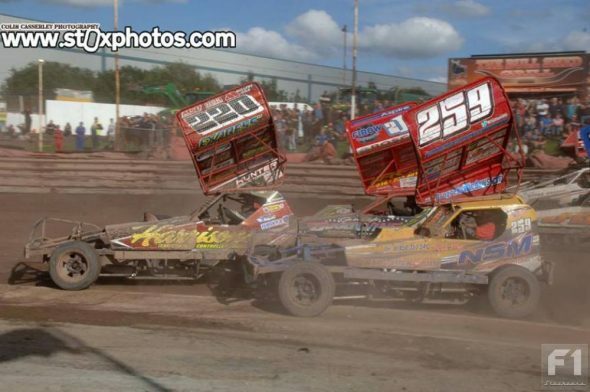 Wainman and Speak traded paint throughout the meeting. Will this continue into Shootout Round 2?